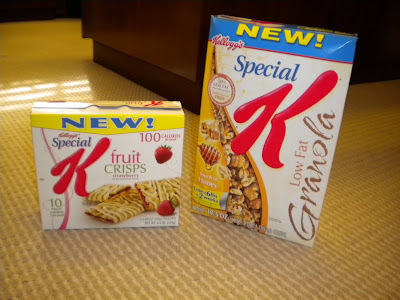 As part of the FoodBuzz Tastemaker program, I was offered the above samples from Kellogg's. The fruit crisps taste like a slimmed down pop-tart - sugary sweet, yet at 100 calories not bad if you need a rush. The granola was tasty, although also quite sweet. These are not the kinds of products I buy regularly but it was neat to sample them as part of this promotion. 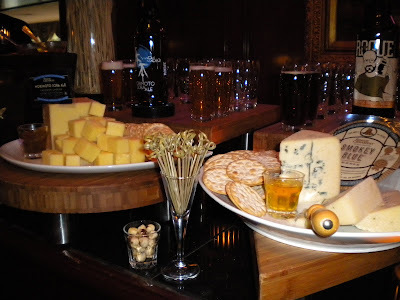 The Ritz-Carlton Buckhead is currently offering a unique pairing of beer and cheese in it's Lobby Lounge. 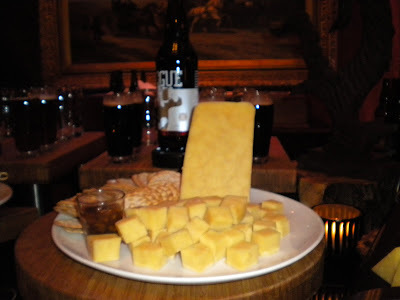 The pairings are: Rogue's Chocolate Stout Ale paired with Chocolate Stout Cheddar, Rogue's Morimoto Soba Ale paired with Morimoto Cheddar, and Rogue's Hazelnut Nectar paired with Smokey Blue Cheese. I had the pleasure of attended a complimentary tasting several weeks ago, and enjoyed the pairings very much. My favorite is the Hazelnut beer with the blue cheese. In addition to the beer and cheese, the pairings are served with various crackers as well as jams and jellies that add a burst of flavor to the mix. The fiery pepper jelly with the blue cheese really worked well, as did the apple rosemary jelly. I also enjoyed the pecan jam with the chocolate stout and chocolate stout cheddar. The jams and jellies are all from Ferrywood Thicket, a local farm. 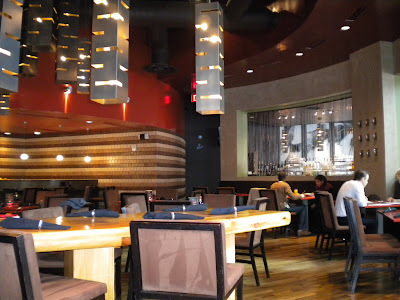 Recently I lunched with friends at STEEL in midtown Atlanta. Although I'd heard much about their Wednesday happy hour free sushi (5-7 PM every Wednesday) from my good friend Mary Beth (an excellent in-home personal trainer - see her website here) this was my first experience at this sleek, modern restaurant. The place was practically empty the day we went for lunch and service was attentive. 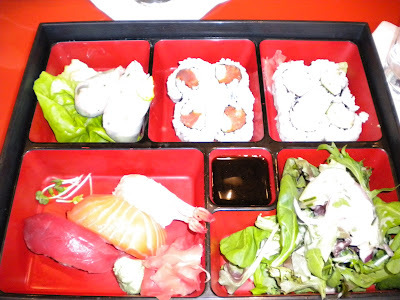 I tried the sushi bento box (above) which included a salad and a choice of spring roll - I had the crabmeat mango fresh roll. The sushi was of decent quality but it wasn't very memorable. 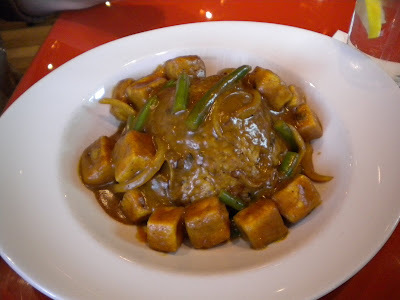 I tried a bite of the curried tofu, which was tasty, although I'd be inclined to add a bit of Sriracha to up the ante a bit. 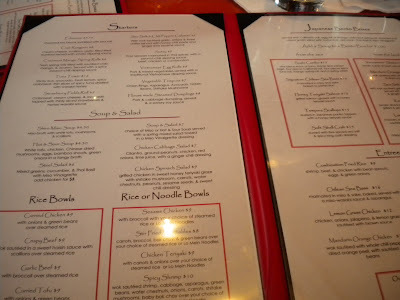 Looking at the dinner menu, it is clear this place could get expensive (entrees from $15 to $28). This is a good place for a business lunch or dinner and there's a free parking deck attached, so that's not a problem. I'd recommend this place if you're in the area and are not on a budget; still, since I've only been once it's hard to make a final call yet. I like this space, although I imagine it could get rather loud when full. A view of the lunch menu. The sign on Broad St. in historic Douglasville. 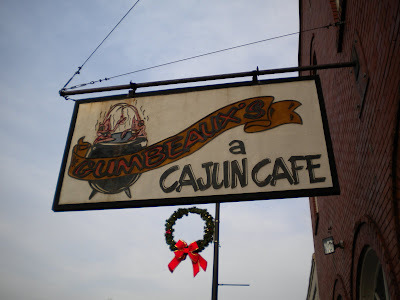 Finally, after Calvin had mentioned several times that I needed to try Gumbeaux's, we finally had the opportunity when we went with our friend John on my birthday back in December. I knew it was a good sign when there was a line starting to form on a Wednesday before 5 PM. We were seated promptly and overall received good service at this casual Cajun joint. We tried several Cajun specialties and the only disappointment were the fried items which were much too salty for my taste. 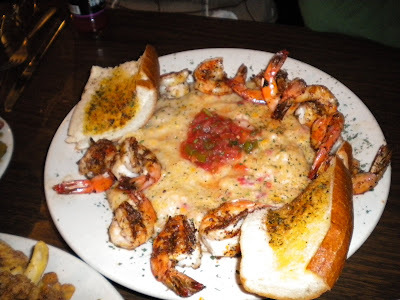 My favorite dish is the shrimp with cheese grits - so delicious. I'd definitely recommend Gumbeaux's if you're in the Douglasville area. Bourbon St. Crawfish Dip. 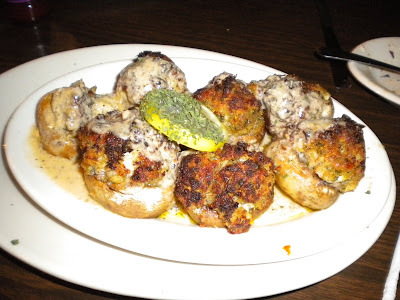 Not as good as the stuffed mushrooms. 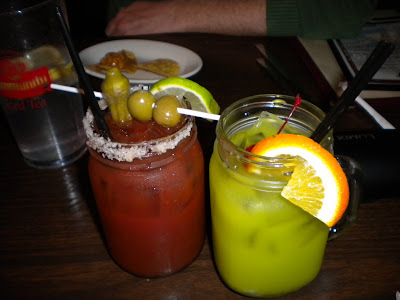 Bloody Mary and a fruity drink. 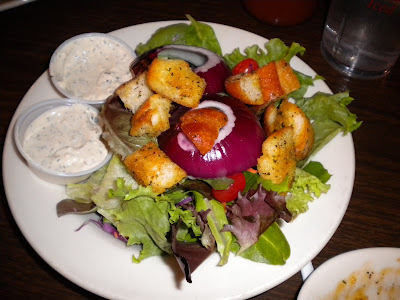 Salad with wonderful homemade blue cheese dressing. 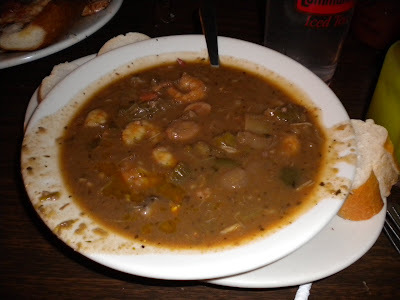 Cajun seafood gumbo - very good! Blackened shrimp and three cheese grits - my favorite! 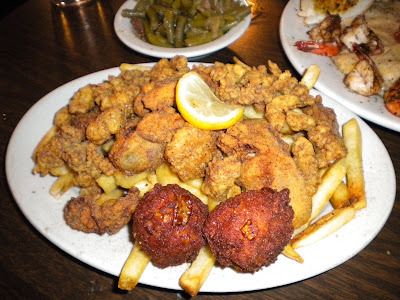 Fried gator and oyster platter - way too salty. The hush puppies were decent. 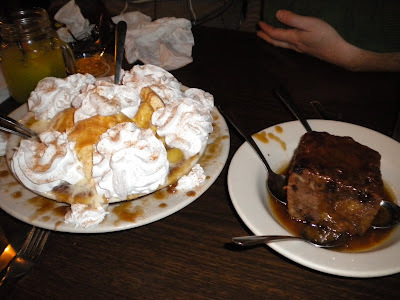 GIANT bananas foster and delicious bread pudding. They sang to me too! Double duty pizza - dinner and dessert! 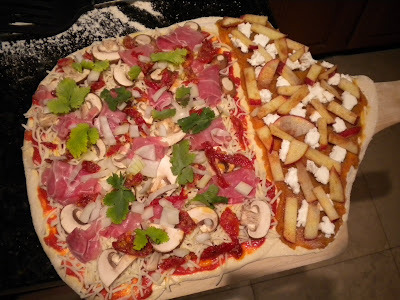 We've been experimenting with pizza making more lately, including this lovely pie with proscuitto, goat cheese mozzarella, mushrooms, sun-dried tomatoes and cilantro on the left and sweet potato butter, mild goat cheese and cinnamon-sugar spiced apple slices on the right. The sweet potato butter and mild goat cheese came from our CSA share, which I'm really missing now that the season is over. The sweet side of the pizza made for a great dessert and an interesting change from the norm. We generously mix in cornmeal with the Trader Joe's pizza dough to make it roll out better. Uncle Julio's is a upscale Mexican chain with sixteen nationwide locations including two in Atlanta. I've dined at the Peachtree Hills location twice and both times had mixed feelings about the experience. The fajitas are good, especially the steak, and although I prefer corn tortillas, the flour ones here are fresh, hot and delicious despite their lack of authenticity. 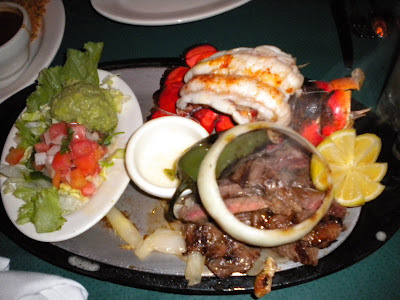 The Cadillac fajitas, a special one Friday evening, were divine and I enjoyed the lobster meat. Prices are on the high side here and while of course one expects to pay premium for lobster, an additional $19.95 was added to our bill for the tail. Thankfully I was sharing - the portions, at least for the fajitas, are enormous and definitely way too much for a single diner. One my other visit we tried calamari - very ho-hum - as well as one of the enchilada dishes and I was not impressed. 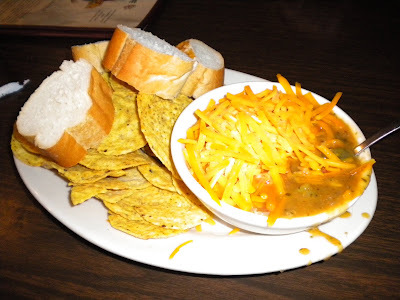 I do like their warm, light chips and the salsa is not bad, although I always add hot sauce! 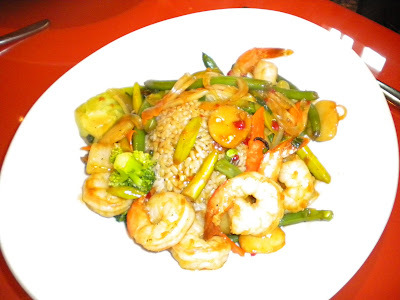 It is also family-friendly, with coloring pages for kids as well as a kid's menu.